The retina is photographed to help with the evaluation of retina lesions and also to help follow the progression of retinal diseases. Our offices have several specialized cameras that are able to photograph the retina. These are useful for both diagnostic purposes and also to help evaluate and follow various retinal lesions. The photograph accompanying this text shows a choroidal nevus: a pigmented lesion in the back of the eye. 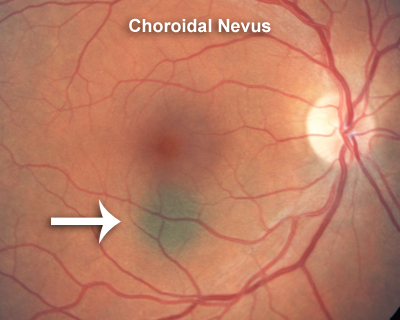 A choroidal nevus need to be carefully followed for growth because it can turn a choroidal melanoma. In addition to standard photography, we will sometimes photograph the retina with different wavelength lights to help diagnose retinal pathology: infra-red, blue, and green. We can also image the retina with fundus autofluorescence - an image that looks at the reflection of certain pigments in the back of the eye that can fluoresce when imaged with a blue light. These other types of fundus photography are described below. What is a Fundus Autofluorescence? The retinal photoreceptors contain light-sensing molecules, a class of retinoids that are susceptible to damage like your skin. The photoreceptors shed their damaged outer segments, which the retinal pigment epithelium (RPE) ingests through phagocytosis. The molecules are stored in liposomes and form lipofuscin. Lipofuscin autofluorescence. Each RPE cell over its lifetime ingests about 3 Billion outer segments, and up to 25 percent of the cell volume will be occupied by lipofuscin. In addition to age, disease states contribute to the buildup of LF in RPE cells. Areas of excess LF accumulation will appear hyperfluorescent or bright on an FAF image. But when RPE cells die or are absent, LF disappears, leading to hypofluorescence or a dark spot on FAF imaging. Not just the RPE. Fluorescence comes from other layers of the retina as well. So a pocket of subretinal fluid which contains rod outer segments will show up as bright on FAF imaging. 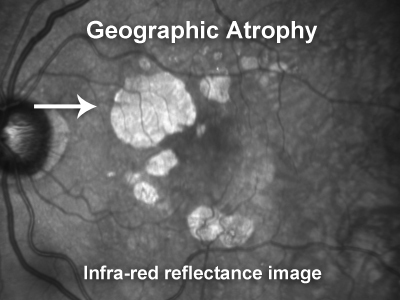 The infra-red reflectance (IR) image of the retina shows abnormalities mostly in the pigmented layers behind the retina. This imaging technique is popular because it is well tolerated by patients. Infra-red is invisible to the human eye so the test is not uncomfortable like some other images requiring a bright light. 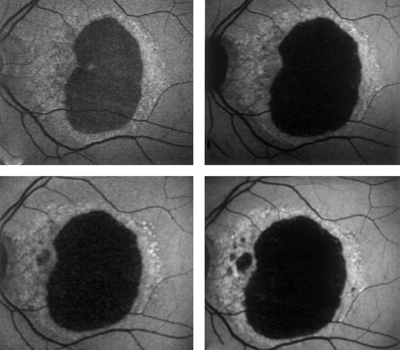 Infra-red reflectance images are helpful in analyzing drusen which are seen with age-related macular degeneration. They also show subretinal fluid nicely. The retinal vessels are well defined with IR images and macular puckers and macular holes can usually be seen with IR. 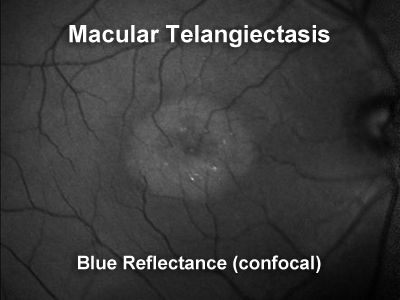 Confocal blue reflectance is helpful in diagnosing macular telangiectasis (MacTel). MacTel has a characteristic ring of increased blue reflectance because of changes the disease causes in pigment distribution in the retina.